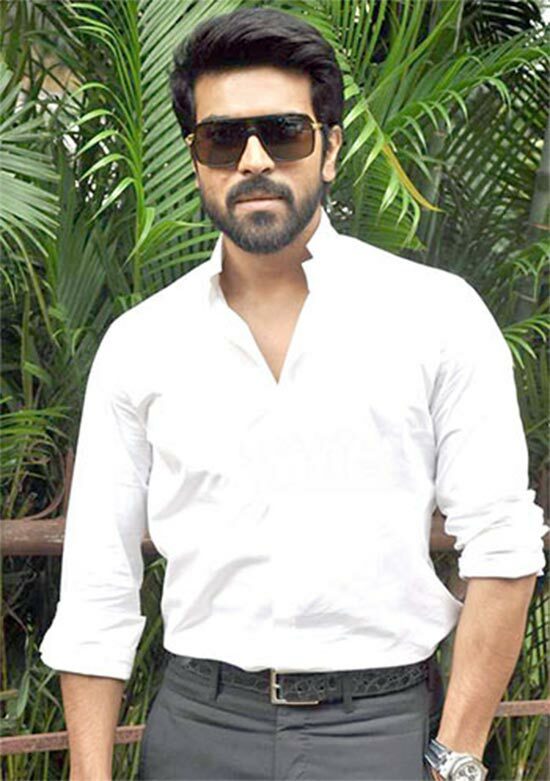 Rediff.com » Business » Can Ram Charan's low cost airline fly high? Hyderabad-based Turbo Megha Airways takes off, promising affordable fares and other benefits. Early this month, Turbo Megha Airways, promoted by actor-politician Chiranjivi's actor son Ram Charan, launched Trujet, becoming the fourth home-grown low cost airline to take off from the South. Its predecessors - Kingfisher, Air Deccan and Paramount - are all grounded. But Trujet with a fleet of three 72-seater ATR-72 planes and a proposed investment of Rs 500 crore (Rs 5 billion) is hoping to buck the trend. A young fleet, better aircraft utilisation and innovative ways to build flier loyalty, the airline believes, will help the brand steer clear of trouble spots. Trujet is headed by former Air Deccan and Kingfisher executive, Vankayalapti Umesh. He believes that he brings invaluable lessons from his previous stints to Trujet. At Air Deccan he learnt how an airline should not expand beyond its capacity, while Kingfisher taught him a lot about branding. V Umesh is managing director and holds 22 per cent stake in the airline which has the backing of 20 investors including Charan who holds 26 per cent stake. Image: Chiranjivi's actor son Ram Charan launched Trujet. Out of its total proposed investment of around Rs 500 crore, Trujet already has invested about 10-15 per cent of the corpus. V Umesh said that the airline, that has set a target of 12 to 24 months for breaking even, will focus on small aircraft and smaller routes. It will soon apply for a licence for the western region where it is looking at the Mumbai-Ahmedabad-Goa sector. To begin with it will focus on busy routes between tier II cities. Its first service from hometown Hyderabad was to Rajahmundry and Tirupati, both extremely busy sectors. It also is the only operator in the Hyderabad-Aurangabad sector. As a special feature, it plans to offer transport services to and from the airport on these routes. It is also going slow with the number of flights between cities - between Hyderabad and Rajahmundry, Trujet operates two out of the 12 daily flights. Others flying the same route are Jet Airways and SpiceJet. On the Hyderabad-Tirupati route, Trujet operates four out of 14 daily flights. Air Costa, Air India, and SpiceJet are the others. All carriers fly ATR 72-500 and Bombardier Q400 turboprops which are 70-80 seaters in this sector. According to V Umesh, Trujet already has three 72-seater ATR-72 planes, which will connect 10 towns from Hyderabad. The six-year old aircraft formerly flew for a Malaysian airline that has since shut operations. 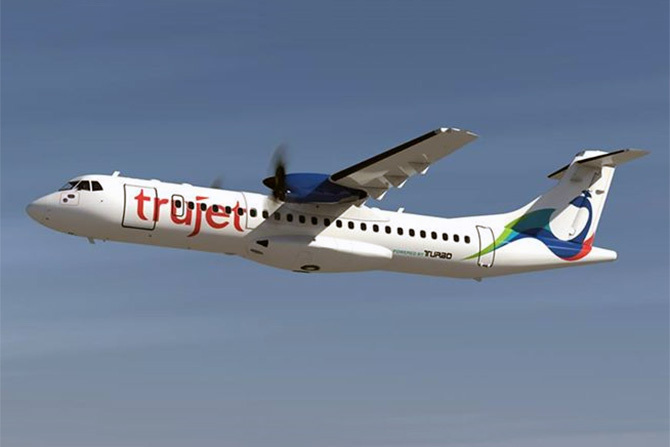 Trujet will induct three more aircraft by January 2016. The airline expects to fly its aircraft for 10 to 20 hours per day. Vasuki Prasad, analyst at The Flying Engineer said "this is good aircraft utilisation for a startup". On the Hyderabad-Aurangabad route where Trujet is currently the only airline, the ATR 72 is the best choice he added. "The choice of aircraft is very wise from the perspectives of the intended missions, operating economics, technical support system, and availability of flight and cabin crew experienced on the aircraft type". Eventually the airline will need to grow to a dual fleet airline, he said to support a network with further growth potential. V Umesh agrees and said that the airline will add bigger aircraft to connect metros but it would take about a year to do that. Trujet will also benefit from the lower fuel prices and tax sops being offered to the sector. Andhra Pradesh, where it is headquartered has lowered the tax on fuel to just one per cent. Also since the airline operates a fleet with less than 80 seats, it has to pay a flat four per cent sales tax on fuel, as opposed to rates as high as 28 per cent applicable to larger aircraft. Besides, since the aircraft weigh less than 40 tonnes, Trujet enjoys landing and navigation fee waivers. With a government keen to promote low cost airlines it is likely that the tax rates will continue to be favourable in the near term. Fuel prices are also unlikely to throw up a major surprise. Thus the low basic fares (Rs 1,499 for Chennai-Rajahmundry, for example), discounts for senior citizens and students will probably continue for a while, allowing the airline to build a strong customer base. Still, many point to the fate of the three other airlines that started out with a similar promise, expressing scepticism over the airline's future. Vasuki Prasad who did not want to comment on Air Deccan's fate said, "In the case of Paramount, it was an airline that was doing well, but faced with management issues. 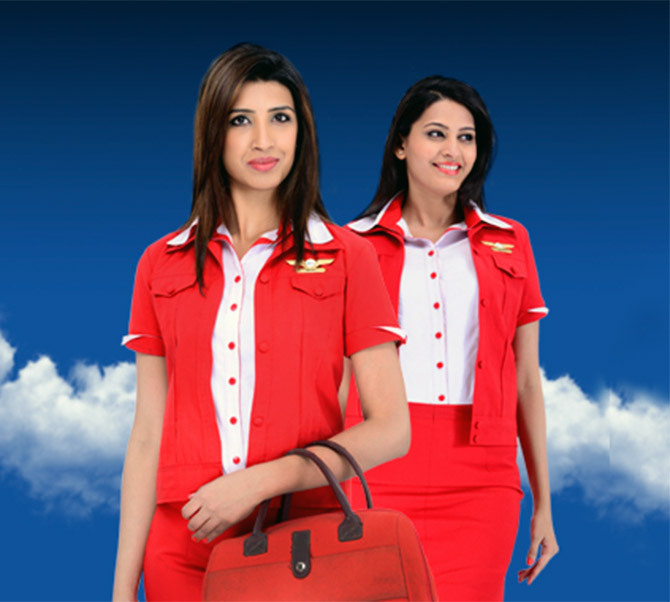 KFA lost focus down the line and offered great service at the cost of financial viability." For Trujet, the key will be in offering not just the right price but also the right bouquet of services, its airport-transfer service being a case in point. Vasuki said that this was an innovative move as everybody loves a single travel solution. But it is important that the airline works out the economics of the business first - for instance passengers wanting to avail the facility ought to pay a premium so that other passengers do not subsidise their costs. Trujet's true test will be its ability to walk this line: keep customers happy without bleeding itself dry.